Just got this great recipe out of Cuisine magazine and we tried it out this weekend. The cornmeal gives these pancakes great texture while folding beaten egg whites into the batter helps keep the pancakes from getting heavy. Top it with orange maple syrup and some pecans and you've got yourself a recipe for awesome. Whisk together dry ingredients in a large bowl; set aside. Combine buttermilk, butter, and egg yolks. Whisk wet ingredients into dry until thoroughly mixed. Beat egg whites in a bowl with a hand mixer (or your awesome stand mixer) until stiff but not dry. Gently fold whites into batter until combined. Do not over mix. Lightly brush preheated griddle with vegetable oil. 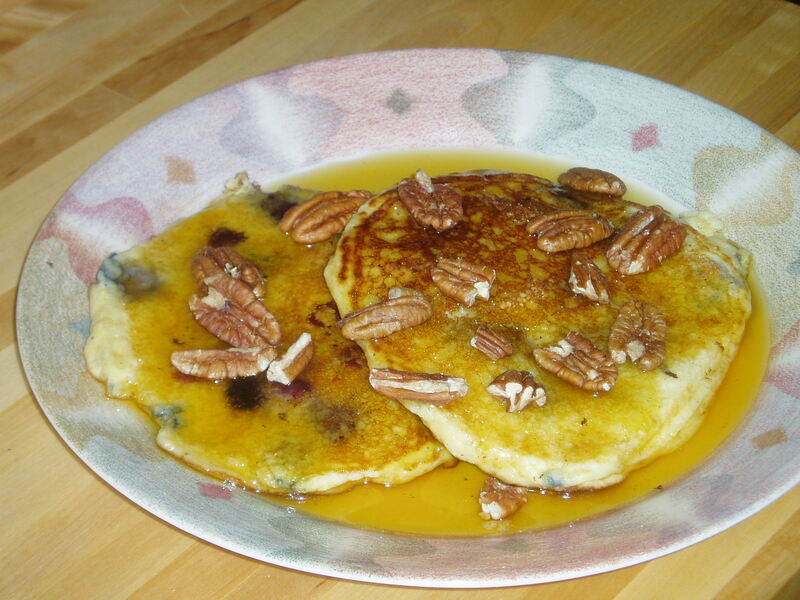 For each pancake, pour a scant 1/2 cup batter onto griddle and sprinkle with some blueberries. Cook until bubbles form on surface and bottom is golden, about 2 minutes. Carefully flip pancakes and cook about 2 minutes longer. Transfer pancakes to a plate and keep warm in oven until ready to serve. Warm all ingredients in a saucepan until heated through. awesome! thank you for posting the recipe. Theres a cafe here in town that serves Blueberry Cornmeal pancakes that I love and have tried to simulate the recipe with absolutely no success at all. I’m going to have to give this recipe a try.